Find a great fog machine at the best price with real value. We guarantee the quality of these fog machines. Putting together a fun and spooky Halloween haunted house does require some intuitive and creative thinking, there are a lot of different things you have to consider to really get that creepy chilling effect of a great haunt. Having an awesome fog machine is one of the main features you need to give that unworldly feel to your haunted house that nothing else matches. If you end up getting a low quality fog machine, you are going to be sorely disappointed in the amount and density of the fog that it produces. Our fog machine will give you really thick and long lasting fog that no other machine can give you, our fog machine is in the big leagues with the professional fog machines that are used on big movie sets and you will have continuous fog that lasts for hours! 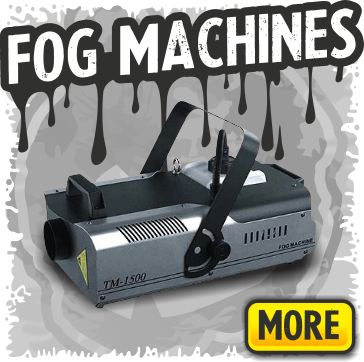 So whether you need low lying ground fog that will roll along your guests feet and make that creepy outdoor or indoor graveyard scene perfect or dense fog that mushrooms in the air to bring a chilling effect thorough out the whole haunt, we have the most awesome fog machine for your needs. We even have a haze fog machine if you only want to have it slightly foggy, and if you can't afford to buy them out right then we have fog machine rentals too. Now that you have one of our amazing fog machines, you now need to juice it up with some of our dynamic fog machine fluid. We have the perfect fog machine fluid for whichever fog machine you have; we even have some that will work great in them all. If you really want to amp up your party or Halloween haunt than try adding some of our innovative fog scents to your fog machine fluid and really amaze your guests with your talent for making a sinister haunt or happening party smell creepy, sweet, or even serine. When you really want to have thick dense fog rolling across the ground or floor of your party or haunt, then our low lying fog machine is going to be the perfect choice for you. You are going to get awesome long lasting fog that will give your haunt just the perfect touch to make it the success of the season. You can use our fabulous low lying fog machine to get that low rolling fog inside or out and since it will last for hours, you are going to be able to actually enjoy the experience, instead of having to constantly worrying about keeping up with your low lying fog machine and special effects. Become the king or queen of winter even in July with our awesome snow machine. Everyone loves the look of snow but hates the cold and hassle of it, now you get all the great benefits of the snow without any of the drawbacks. You can flurries at your convenience with our wonderful snow machine. But hey if blizzards are more your thing then this amazing snow machine can do that too. Just juice it up turn it on and adjust the snow machine to how thick and fast you want your snow to fill the yard or room and you will have a winter wonderland no matter the temperature outside, and the clean up will be a breeze. Talking about having a great scene, you can really bring the realism to your Halloween haunted house or party event by adding some of our fabulous fog scent to your fog machine. Whether you plan on having a sweet birthday party, a trippy rave, or a sinister and creepy Halloween haunted house, we have the scent for you to amp your event to the next exciting level. Since we have 30 fog scents to choose from and they are only $9.95 each you can have several different fog scents running throughout your event, and it is guaranteed not to put your budget in the red zone. Choose two, three, or even more of these fog scents to make your event smell just like it looks and have your haunt rise above all expectations.